Heat oven to 400°F. Spray 13x9-inch (3-quart) glass baking dish with nonstick cooking spray. Cook manicotti to desired doneness as directed on package. Drain; rinse with cold water to cool. Drain well. Meanwhile, in large bowl, combine ground beef, spinach, cheese, pesto and egg. If desired, add salt and pepper; mix well. For easier stuffing, place beef mixture in resealable freezer plastic bag; seal bag. Cut about 1-inch hole in bottom corner of bag. 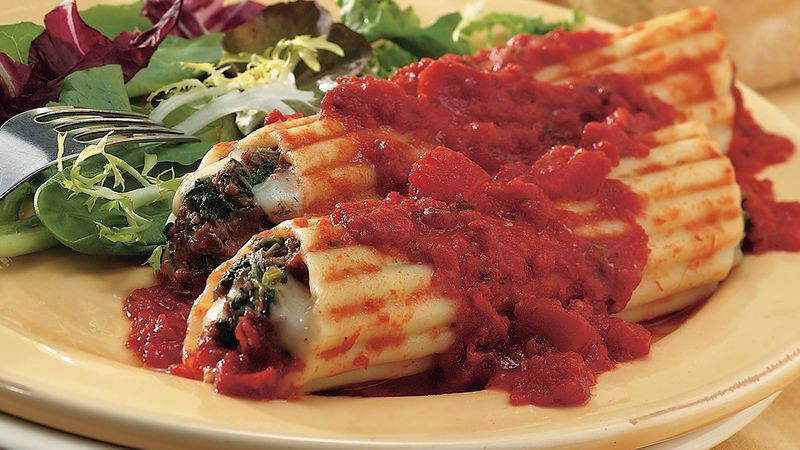 Fill each manicotti by squeezing beef mixture into manicotti; place in sprayed baking dish. Pour pasta sauce over manicotti. Cover with foil. Bake 30 to 40 minutes or until filling is no longer pink in center. Instead of using the plastic bag to fill the manicotti, you can also use a teaspoon and small rubber spatula to stuff them.